How to Look Good in a TV Interview? Even the smartest of men get scared to appear on the television. People often get goose bumps while appearing on TV. Some common questions like ‘how do I look?’, ‘what should I say?’ come to their mind. These questions and doubts make them extremely nervous and prevent them from looking their true self during the television interview. This is because they are not mentally prepared for a television interview. 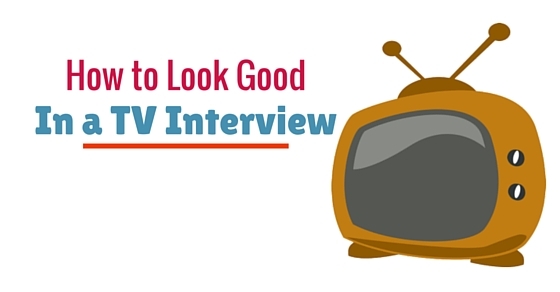 Here are some simple tips and suggestions that will help you look impressive during a television interview. Opt for clothes that will make you feel comfortable and help you to create a positive image. Avoid shirts that come with checks or stripes. They often cause distraction for most TV viewers. Avoid colors like bright red and white as well. Instead, opt for dark colors or beige. Don’t wear a hat unless you are attending a sports related TV interview. In case you have a receding hairline, apply a bit of baby powder to do away with the shine. Don’t wear any type of jewelry as it can distract your audience. If you are comfortable in the attire you have selected for the television interview, it will make you feel happy and confident. Confidence is a major ingredient in the success of a television interview. Selecting outfits that look good on you make the audience concentrate you rather than get distracted. Hence, you need to be extremely careful about these choices while attending a television interview. If you have a clear idea about the topic on which the interview would be based, take some time to think about the key points you would like to emphasize upon. Even if the interview lasts for 15 minutes, the TV channel will reduce it to two or three minutes. So keep your views to the point and work on sound bites that will help viewers associate you with your message. If you rehearse beforehand and know what you are going to speak on screen, it will help you perform better during the course of the TV interview. A little practice will also help you have a proper voice. You will be able to know where you need to modulate your tone or alter your volume. You must remember that since every bit that you speak can make a great impact on screen, proper modulation and control is a must on your part. This is a common guideline that you need to follow when you are giving a television interview. You must look into the camera and speak only when you are told to do so. In certain television interviews, looking into the camera can actually hamper your presence onscreen and hence should be avoided. Maintain an eye contact with the interviewer or a group of people if it’s a panel interview while you talk. Your body language will matter the most while you speak. If you can’t look at a person on his face, focus on something else. If you have an option, send the journalist who would be taking the interview some questions. But do so only if you have their answers. Greater knowledge about the topic on which you are going to be interviewed will help you appear more confident on screen. This will take the interview towards a direction you are clear with. You won’t have to look for words while responding to some questions as a result. Very often, individuals who are interviewed on screen fumble or waver because they do not know what to expect next. When you have already send your queries to the interviewer, things can be quite different. It helps you fine tune the interview in your direction. This is most desirable when you are being interviewed on screen. Body language is of maximum importance when you are being interviewed on the TV. This is because there are countless people watching you and any wrong gesture or body language can be viewed by the masses. If it’s your first TV interview, then you are likely to feel nervous. But don’t show it on your face. Maintain eye contact with the moderator/interviewer and don’t overuse your hand gestures. You can keep them on your lap if you have a habit of using them. Be alert and try to avoid itching, scratching or digging for gold. You need to remember that you are being watched by millions and any small error can be embarrassing. If you are asked an off track question, lead the interviewer back to the main topic. If you are well prepared but have only a few points to highlight, use short, brief sentences to ensure that all questions stay on the right track. Very often, TV interviews are all about focus. If the interviewer loses focus, you may not know how to answer the questions posed to you. Hence it is vital that you maintain your focus during the entire interview process. Most people find it difficult to maintain their focus on one thing during interviews and seminars. If you suffer from similar issues, you may try playing games that enhance your concentration level. The different brain training games help to enhance concentration and improve agility of mind. You need to be discreet with your answers. Don’t restrict your answer to ‘yes’ or ‘no’. But give the interviewer the time to ask his questions rather than interrupt him with your lengthy answers. A standard length where the question is answered and yet is not too lengthy to be termed boring or annoying is always preferred in television interviews. You must remember that the viewers will be interested in your interview only if the interviewer has an equal say in the whole process. The television interview should never be one sided. You must remember that a television interview is being watched by several people. You need to have a fervent belief in what you say and be honest about it. Your views shouldn’t be restricted to a few points. This is because any part of the interview after editing can misrepresent what you wanted to say. That is the reason why you need to be extremely clear about what you meant to say. In any section of the interview, the message should not be disoriented or misrepresented. You must try to make sure that what is conveyed to the viewers is the same as what you wished to convey. Many people have a problem of increasing the pitch of their voice whenever they become excited. If you also have a similar habit, try to control it. People may have a problem trying to find out what you want to say. High volume becomes shrill and difficult to decipher. So, when you feel charged up during the interview take a deep breath and respond slowly and clearly. Your motive should be that the audience understands exactly what you wish to convey. Practicing beforehand will make you feel at home during the interview. You can take the help of a friend while doing so. It will help you find out how you look in front of the audience and help you to work on body language related problems. Practice is the main key to being confident on screen. If you seek the assistance of people you know, things can be much simpler. If you possess stage fear or similar other problems, practice can help you deal with these. You may try practising in front of the mirror to get rid of your nervousness and tension. Writing down what you plan to speak is another great practice. Writing down helps you arrange your thoughts in a proper sequence. It helps you speak confidently and effectively. The television interviews usually revolve around an event or incident and if you are well prepared, no one can stop you from being a star on screen. Proper practice helps you perform well and speak confidently. There are very few individuals who are lucky enough to be interviewed on screen for any reason whatsoever. Individuals who have a good on screen presence and a photogenic face always give successful television interviews. Previous articleHow to Answer Software Design Interview Questions?